White working-class children need schools with incentives to attract high-quality teachers and longer days to allow pupils to do their homework, says a cross-party committee of MPs. The Education Select Committee has been examining the underachievement of poor white children in England. Their exam results are much worse than disadvantaged black or Asian pupils. The MPs' report describes poor white youngsters as "consistently the lowest performing group in the country". The report - Underachievement in Education by White Working Class Children - identifies this as a "real and persistent" problem. Poor white children are already lagging behind when they start primary school, and the gap grows wider as they get older. As each school year passes, this attainment gap sees them falling further behind wealthier white pupils and poor children from ethnic minorities. 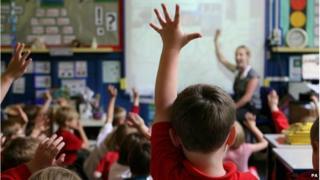 The rising results among poor black and Asian pupils shows "improvements can be made", MPs say. Source: House of Commons Education Select Committee. This report "holds a mirror up to the situation - it does not attempt to solve the problem", but it makes some recommendations to lessen this underachievement. Poor pupils of all ethnic backgrounds are much more likely to do well in outstanding schools. The report shows that 50% of pupils eligible for free school meals will achieve a benchmark of five good GCSEs if they attend a school rated by Ofsted as outstanding. This compares with only 25% in a school rated as inadequate. The report argues that as a particularly low-achieving group, poor white children would have the most to gain from access to outstanding schools and the best teachers. There should be incentives to recruit high-quality teachers into schools that could help these pupils, argues the report. "Schools face a battle for resources and talent, and those serving poor white communities need a better chance of winning," it says. There are practical forms of help, says the report, such as allowing time and space for children to do their homework at school, which could mean extending the school day. The pupil premium, which targets funds at poor children, was welcomed as likely to make a difference. Media captionEducation Select Committee chairman Graham Stuart: "The most important thing is to get children from poor families into the classroom of great teachers"
The committee heard evidence about causes of this underachievement. Ofsted chief Sir Michael Wilshaw highlighted the importance of supportive parents, irrespective of income. "Poverty of expectation bears harder on educational achievement than material poverty, hard though that can be. And these expectations start at home." Representatives of Leicester City Council told MPs that there were parts of the city where "white working class culture is characterised by low aspirations and negative attitudes towards education". But the Joseph Rowntree Foundation, which has researched poverty, rejected the idea of low parental aspirations, but instead blamed a lack of self-belief among white working-class families. They wanted their children to be high achievers, but had a much lower expectation than middle-class families that they would be able to "achieve their goals". Prof Alison Wolf, from King's College London, highlighted the link between concentrations of underachievement in school and where traditional industrial jobs had disappeared. "A lot of the careers and jobs that were the bedrock of white working-class family life for many decades and generations have vanished and have not been well replaced," she said. Committee chairman Graham Stuart said working-class parents might not realise how much the labour market had changed - and that their children would face a tough future if they failed to achieve in school. "They might have hated school, left early - but still did well for themselves and they mistakenly assume their children can do the same," he said. "Children from disadvantaged backgrounds will not be as school ready as others for the simple reason if you have not had a meal in the evening, slept in your own bed or had breakfast, that will impact on your ability to learn," said general secretary Christine Blower. Labour's shadow education secretary Tristram Hunt said: "The report is right to identify that the most important thing for raising standards is to ensure a highly motivated and highly skilled teacher in every classroom." But he warned that this meant "ensuring that all teachers become properly qualified and continue to build their skills". "This is how we narrow the attainment gap between deprived children and the rest." A Department for Education spokesman said the pupil premium was providing £2.5bn per year to support disadvantaged pupils and that schemes such as Teach First were recruiting good teachers for tough areas. "The over-riding objective of our reforms is to improve the attainment of the poorest children in society - and we are already seeing real improvements," he said. "We have made it easier for all schools, not just academies and free schools, to extend the length of the school day."